Artificial intelligence is changing the transport sector. From helping cars, trains, ships and aeroplanes to function autonomously, to making traffic flows smoother, it is already applied in numerous transport fields. Beyond making our lives easier, it can help to make all transport modes safer, cleaner, smarter and more efficient. Artificial intelligence-led autonomous transport could for instance help to reduce the human errors that are involved in many traffic accidents. However, with these opportunities come real challenges, including unintended consequences and misuse such as cyber-attacks and biased decisions about transport. There are also ramifications for employment, and ethical questions regarding liability for the decisions taken by artificial intelligence in the place of humans. The EU is taking steps to adapt its regulatory framework to these developments, so that it supports innovation while at the same time ensuring respect for fundamental values and rights. 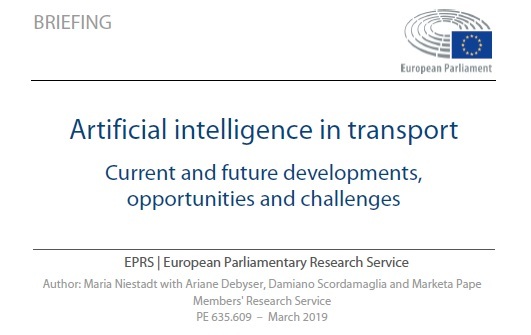 The measures already taken include general strategies on artificial intelligence and rules that support the technologies enabling the application of artificial intelligence in transport. In addition, the EU provides financial support, in particular for research.